Europe has another political crisis on its hands, and this one could be a big one as it is right in the middle of Europe's growth dynamo "ground zero." As the WSJ reports, a rebellion over immigration in German Chancellor Angela Merkel’s conservative bloc is threatening the stability of her fragile coalition. Merkel’s weekend decision to veto a plan by her interior minister aimed at controlling and reducing illegal migration, and the minister’s refusal to back down, has already shattered an uneasy truce between conservative backers and opponents of her liberal asylum policy, just months after a tenuous coalition government was formed. Chancellor Angela Merkel and Interior Minister Horst Seehofer are in a standoff over immigration. As a result, on Thursday Merkel faced a showdown within her conservative camp over the the future of immigration policy that threatens her political future. And, as The Local adds, after late-night talks Wednesday failed to resolve the heated immigration dispute, a parliamentary session was suspended Thursday to allow the rival camps to huddle for tense strategy meetings. Specifically, Merkel is facing a rebellion from her hardline Interior Minister Horst Seehofer, who demands that German border police be given the right to turn back migrants without identity papers or who are already registered elsewhere in the European Union. The chancellor fears that such a move would be seen as further antagonizing already stretched nationalist tentions across the EU and be seen as Germany going it alone, hurting over-burdened frontline Mediterranean countries such as Italy and Greece, and has urged a negotiated EU response instead. Merkel, the longest-serving EU leader, called immigration "a litmus test for the future of Europe" on Wednesday - but the issue has now rapidly turned into a test of Merkel's own grip on power at home. 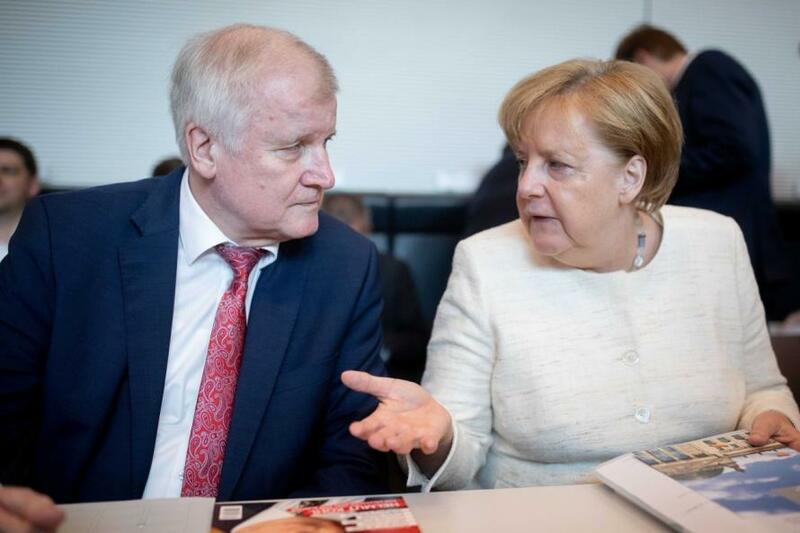 Meanwhile, Augsburger Allgemeine reported on Thursday that Seehofer’s CSU is considered breaking off their alliance with the Merkel’s CDU in the Bundestag. In other words, an outright rebellion within the government, ending the ruling coalition. The tensions have been building for years: Seehofer, from Bavaria state's CSU party, has long been harshly critical of Merkel's decision to open German borders in mid-2015 to a mass influx of over one million asylum seekers. At the height of the crisis, tens of thousands of people fleeing war and misery in Syria, Iraq and other countries crossed the Austrian border into Germany per day in the Alpine state of Bavaria. The consequences are well know: the mass refugee arrivals, together with numerous high-profile crimes committed by migrants and terrorist attacks by ISIS-sympathizers since, sparked the rise of Germany's anti-immigrant AfD party, which entered parliament last year, upending German politics while support for Germany's establishment parties cratered. As positions in Merkel's latest domestic battle hardened, the CSU's Bavarian state premier Markus Soeder said that "in immigration, we must no longer do things by halves. We must think about the local population, not just the rest of Europe." What makes the rebellion especially surprising is that Merkel's CDU and the more conservative CSU are traditional sister parties, but the emotional immigration issue has opened a rift between them that is deepening as the CSU faces an electoral threat by the AfD in a state poll in October. In sharp contrast to Merkel, Seehofer has voiced open sympathies for right-wing populist governments that are tough on immigration, from Hungary to Austria and Italy. When Seehofer met Austrian Chancellor Sebastian Kurz on Wednesday, Kurz announced that the interior ministers in Vienna, Rome and Berlin had formed an "axis of the willing" to combat illegal immigration. Which is just the thing Merkel, and her liberal, globalist influencers, hates to hear. The same day Seehofer boycotted Merkel's "integration summit", grouping volunteers and agencies that support refugees, first citing a calendar clash and then saying he objected to the presence of a critical journalist there. For Merkel, the row within her conservative family is the worst crisis in her fourth-term government, which took half a year to build after the inconclusive elections last year and also includes the centre-left Social Democrats (SPD), the other party to see its support crater at the last elections at the expense of the AfD. After three-hour talks between Merkel and Seehofer late Wednesday failed to resolve the border control issue, a session in the Bundestag was halted Thursday so the CDU and CSU camps could huddle separately, a highly unusual step. But worst of all for the chancellor, is that Merkel's support on the border issue also appears weak within her own CDU ranks, with a Bild daily poll of MPs finding that just a handful were willing to publicly back her on the issue. One of the CDU lawmakers, Axel Fischer, said that "we've been discussing this topic since 2015. At some stage, we must reach a decision, if necessary with a vote of confidence." The CDU on Thursday offered a compromise to the CSU - giving border police the right to immediately turn back migrants who have previously been denied asylum in Germany. Merkel's party also said Berlin should quickly reach agreements with frontline states on returning migrants there, with the goal of "avoiding uncoordinated, unilateral steps at the expense of third parties" in the EU. But this approach did not appear to appease the CSU, whose lawmaker Alexander Dobrindt reiterated that "we have told the CDU that we see a need for action right now". The bottom line for Merkel: admit that her refugee policy has been disastrous and reverse it, or suffer a rebellion, either within her coalition or her own party, and find her political career over in the most bizarre way imaginable: by pushing a George Soros agenda, which is gradually claiming the political life of every "progressive, liberal" European politician.